We live in Florida, so our summers are filled with days at the beach or in our pool. All of the salt and chlorine really causes a lot of damage to their hair, especially my youngest son who has light blond hair which starts to take on a green tint. 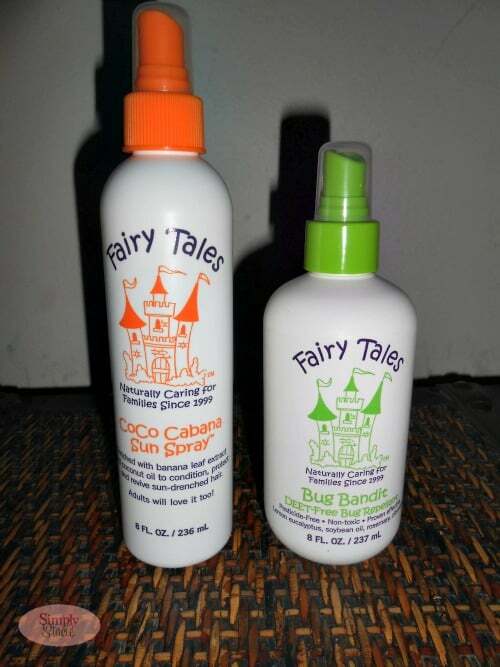 A lot of the drugstore brands that I have used in the past have been overly harsh on their delicate hair so I was very excited to discover that Fairy Tales Hair Care has a Sun & Swim line of products and even an effective bug repellent. 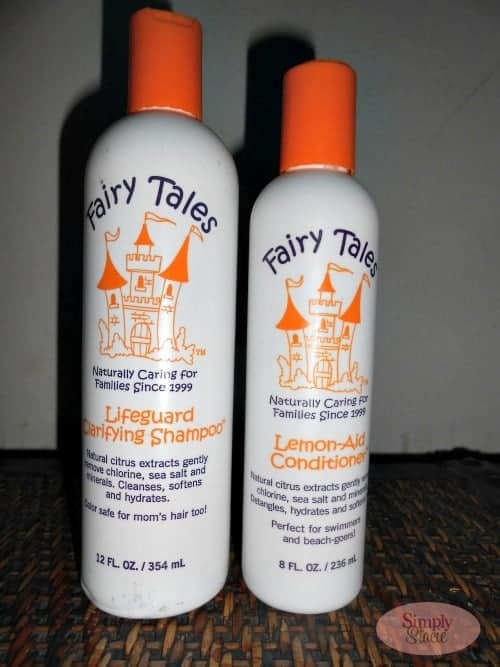 The Fairy Tales Sun & Swim hair care collection is designed specifically for children (though I have used it too) and features naturally derived ingredients which is very important to me. Working to remove sea salt, chlorine which can damage hair and cause that horrible green hue and every day build up, this line helps to restore healthier looking hair by adding in vitamin. I start by shampooing their hair with the Lifeguard Clarifying Shampoo which is perfect to use after swimming at the beach or in the pool. The gentle citrus extracts remove sea salts, chlorine and minerals which can damage the hair especially after frequent exposure during the summer months. It includes aloe and jojoba to help add moisture back into the hair and sets up the hair for conditioning ultimately making detangling an easier process. Since it is color safe, I can also use this product on my own hair too making this product a summer essential for my entire family. To condition, I love the Lemon-Aid Conditioner™ which also has natural citrus extracts such as grapefruit peel oil, orange flower and pineapple extracts to further remove chlorine, sea salts and minerals while also detangling, hydrating and softening the hair. My daughter gets the most horrible tangles that often leave her in tears but when using this product, we comb it through her hair before rinsing. We then rinse it out and gently towel dry before combing her hair and letting it air dry. Another great feature of this product is the wonderful, fresh scent and I appreciate that a little bit of this conditioner goes a long way to condition my children’s hair nicely. Another must-have in our beach bag is the CoCo Cabana Spray ($9.95) which features banana leaf extract and coconut oil to help protect the hair against the harsh conditions of the sun and surf. Years ago, my stylist taught me a valuable tip that I should also wet my hair and spray on a conditioner before going in the pool or sitting out in the sun. I do the same thing with my children’s hair using the CoCo Cabana Spray which provides a barrier to the hair and provides long lasting conditioning. Finally, for those pesky bugs (have I mentioned we have mosquitoes in Florida the size of small cats, perhaps just a slight exaggeration). I was impressed with the performance of Bug Bandit DEET-Free Bug Repellant ($13.95/8 ounces). I can feel confident that my children are not getting bitten by insects and we don’t have to drench their skin in harmful chemicals because this product is pesticide-free and non-toxic. It uses natural essential oils such as rosemary, citronella, eucalyptus, lemongrass, cedar bark and soy bean oil to repel the bugs. We first used this product at the Fourth of July fireworks show which is held at a large lake in our town. We applied prior to going and once more during our five hour stay and there were no issues with getting bitten by bugs….very impressive! You are invited to visit Fairy Tales Hair Care to purchase any of these wonderful summer products or learn more about the entire hair care collection for children (and adults). that lifeguard shampoo looks terrific for summer! I would also love to try the Rosemary Repel Conditioning Spray! The No More Knots would be nice for stress free brushing. I would maybe have to borrow it for myself to help eliminate hair breakage. I would like the no more knots. No more knots would be nice to try. I hate brushing out her hair. With the girls starting school soon – I would like to have the Lice Repel handy 🙂 Those little guys are scary! I would love to try the CoCo Cabana Spray. My daughter could us the no more knots. I would love to try the tangle tamer! Lemon aide conditioner would be heaven. Would love to try the No More Knots. The Rosemary Repel sounds like a great product. Curly-Q Natural Curl Maker Gel. No Knots would be great. I would love to try No More Knots. i would like to try the lifeguard clarifying shampoo! I’d like to try the Static Free Leave-in Detangling Spray. I would love to try the Bug Bandit DEET-Free Bug Repellant since these mosquitoes are ridiculous when you live near water. I would like to try the Rosemary Repel Shampoo.